Producing food is one of our most vital human activities. And, growing it successfully depends, of course, on the stability of our climate. But an increasing global population, pressure on natural resources like fresh water and arable land not to mention extreme and erratic weather escalate the risk of decreasing yields and failing crops. 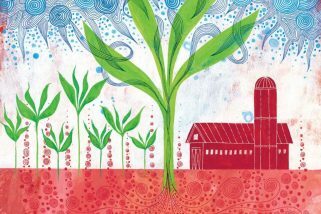 A key to maintaining global food security is nurturing our soils—where 95% of our food is grown. Carbon feeds soil, allowing it to produce greater yields of nutrient-dense foods that are appropriate to our individual climates and cultures. In order to increase the amount of carbon in our cultivated soils, we must accelerate the transition to regenerative, organic and agroecological farming systems—these include diverse crop rotations and intercropping, cover cropping, recycling of farm products like crop residues and manure, agroforestry and holistic planned and well managed grazing. We need to quickly move away from monocultures — the practice of growing one crop in large quantities under industrial conditions because the industrial food system externalizes many of its true costs by passing them on to society and the environment. Indeed, industrial food and farming relies heavily on fossil fuels, encourages animal cruelty, endangers pollinator health, depletes soil organic matter, contaminates waterways and, lacking diversification, is increasingly susceptible to crop failure in the face of an unstable climate. In contrast regenerative systems of agriculture build soil health and soil carbon, support seed and crop diversity, provide food and habitat for pollinators and other wildlife, don’t rely on fossil fuel inputs and celebrate seasonality. Despite industry claims to the contrary, these systems can be extraordinarily productive and have been also shown to be more resilient to extreme weather events such as hurricanes.